Jim is a photographic artist residing in Waterloo, Ontario, Canada. He specializes in black-and-white photography, and is a traditionalist with respect to his methodology in that he uses film to capture his images and a "wet" darkroom to craft his prints. He works by immersing himself in a place for extended periods of time, whether it be locally or during his travels. He finds inspiration in a wide range of subject matter, from small details to grand landscapes, and his finished work often has a distinctively abstract quality to it. 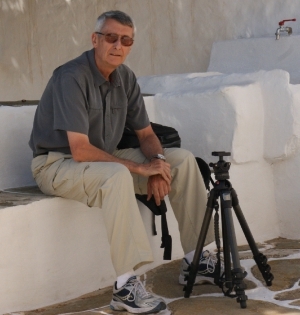 His photographs have appeared in several publications and he has had exhibitions provincially in Barry's Bay, Brantford, Cambridge, Elmira, Kitchener, Ottawa, Toronto and Waterloo, Ontario, and internationally in Szymbark, Poland and Sifnos, Greece. His work may be seen at The Art District Gallery in Kitchener, Ontario, and may also be viewed online at: Panorama Gallery and at: Sifnos Trails.